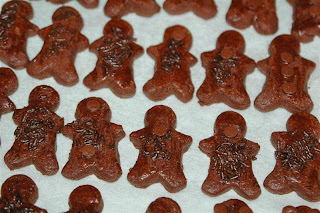 Oh oh here she comes...she's the chocolate men eater! 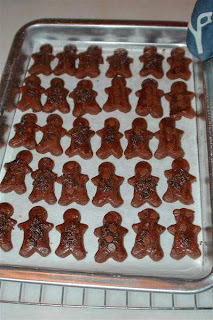 Feast your eyes on these...here's how I churn out my army of little chocolate men! Pre-heat oven to 175 degrees Celsius. Beat butter, sugar, vanilla essence and salt until creamy and fluffy. Blend in egg yolk and mix well. Fold in flour and chocolate chips. Divide dough into 2 portions and chill in fridge for an hour. Then cut out cookie into desired shapes. Brush surface of cookies with egg white and bake for about 30 minutes. 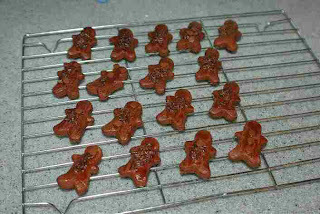 Remove once done and let cookies cool down before storing in an airtight container. 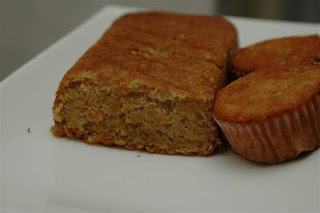 Apple Cake & Muffins anyone? I can't recall when I last had some 'kick back' time but this afternoon was one of those rare days. After I had completed my lastest assignment this morning, I decided to treat myself by trying out a new recipe from Chef Wan's Sweet Treats book. Pre-heat oven to 180 degrees Celsius. Cream butter and sugar until light and fluffy. Add eggs one at a time followed by grated apples. Then add in the yogurt and vanilla essence to the mixture together with cinnamon powder. Sift flour with salt and baking soda before folding these into the batter. Pour into a greased and floured 22 cm cake pan. Bake for 50 minutes and then remove from oven to cool. Note: I misread the instructions and poured the 2/3 of the batter into a loaf pan instead! The rest I divided into a 6-cup muffin pan ;-P This essentially changes the cooking time of course. I baked the first loaf for about 30 minutes or thereabouts - once the skewer inserted into the cake came out clean, I removed it from the oven. The muffins went in for about 20 minutes. All in all, it wasn't a very successful attempt. 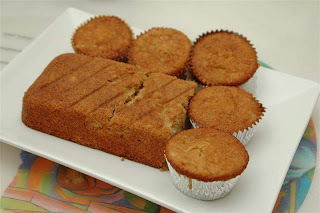 The overall texture of the loaf turned out nice and soft but I noticed a sticky layer just above the bottom crust which according to Chef Wan's notes indicated too much liquid - I figured it must be the grated apples which of course had more water content in them compared to mashed bananas! Luckily the muffins fared much better. But the taste-wise the cake was delicious! From professional shipbuilder to captain of a five-star Chinese kitchen. Folks, meet Meet Chef Louie Hoi, executive Chinese chef of One World Hotel’s Zuan Yuan restaurant. The affable chef discovered his culinary vocation by coincidence after he started helping out at a family member's restaurant during the 1980s economic downturn. Today, Chef Louie Hoi is the man in charge of Zuan Yuan's maiden appearance in the 2007 Malaysia International Gourmet Festival (MIGF). Zuan Yuan, which means ‘diamond garden’ in Chinese, simply exudes classy sophistication - thanks to its plush interior of polished silver leaf ceiling, sleek ebony doors and ornate displays of Chinese objects d'art. 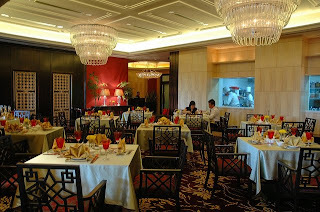 The menu emphasises modern Cantonese cuisine coupled with some classic Teochew delicacies. Even the Dim Sum comes with a slight twist – Taro Dumplings (woo kok to you and me) with its scrumptious Scallop and Miso Sauce (RM11++ per plate) filling are worth returning for. More delicate in taste but no less delicious are the Steamed Teochew Dumplings (RM10++ per basket). Pity about the rather thick Cheong Fun but the filling of Gooseliver & Char Koay is quite unusual and worth sampling (RM8++ per plate). Fortunately, the Zuan Yuan’s MIGF starter of Cold Sliced Seared Tuna and Phoenix Roll with Home-made Mustard Sauce made up for the earlier hiccup. Chef Hoi artfully blends Japanese and Chinese cooking influences to enhance the tuna’s inherent sweetness and poached chicken’s succulence. Complementing it was a zingy-tangy-sweet sauce concocted from Chinese yellow mustard, mirin and myriad flavourings that the chef naturally declined to reveal. An exquisite treat fit for a king is the Pan-fried Imperial Treasures in which Scallops were rolled with Bacon and Foie Gras, and glazed with Mint Sauce. Dark, intense and zesty, the rich, velvety smooth gooseliver and crisp bacon were fully embraced by the succulent scallops. The Oriental Phoenix creation or Ostrich Fillet with Oriental Spiced Black Pepper Sauce is complemented by a soft, succulent disc of fried egg white and a robust ginger and black peppercorns sauce. Giving it a nice balance are some Chinese wolfberries and sautéed celery. Taking a leaf out of our local Nyonya culinary heritage, Chef Hoi proffers Steamed Cod Fillet with Aromatic Ginger Flower Sauce. 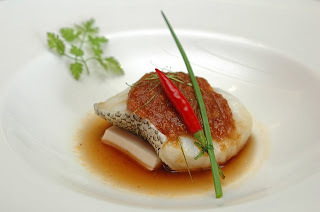 Imagine the cod’s indulgent smoothness matched with a mildly sweet and spicy sambal of red chilli blended with fresh torch ginger flower, lemon grass and kaffir lime leaves. the fluffy rice has no trace of greasiness in it. Chilled Treasures in the form of Chilled Aloe Vera infused with Lemon Grass is a guilt-free, tangy and herbal jelly. A most welcome change from the usual coconut milk and sugary broths that other Chinese restaurant have. Priced at RM99.80++ per person (food only) and RM120++ (with wines), Zuan Yuan’s distinctive MIGF menu has proved to be a real gem. Heavenly death by Chocolate with Truffle to boot! The eclectic crowd who knows about chic Parisian-style eatery, Café Café at Jalan Maharajalela in Kuala Lumpur will adore this place. Despite being newcomers to the cut-throat F&B biz five years ago, Ben Yeong and Toto Ooi have naysayers flummoxed over their success. And they about to repeat it with Banquet. We stumbled upon the outlet when we went to check out the newly opened Bangsar Village 2. With old folks in tow and a kid, it's not easy to find an eatery that suit everyone. Still the classy place offers a good East-West menu (NOT fusion but segregated into separate sections). Get past the 'chi chi' chandeliers and you'd feel right at home, lolling in the white wicker chairs that go with the white marble tables. Rows of potted fir trees give the dining area a mock outdoorsy feel. One tends to have the impression of being waited on hand and foot by a battalion of chefs as the service team is immaculately garbed in spotless white chef’s uniforms. We were surprised the local items stayed true to tradition while the European-style salads, appetizers and mains will strike a chord with more sophisticated tastebuds. Definitely a good place to bring Mom, aunties and trendy gal-pals! Had a recent windfall? 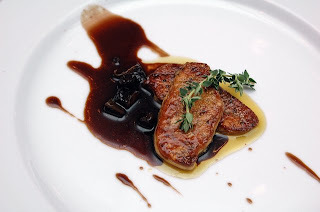 Treat yourself to the Pan-Seared Foie Gras (RM45++) served with olive oil and fruity apple reduction. Supremely smooth yet light enough to leave you feeling hugely satisfied. 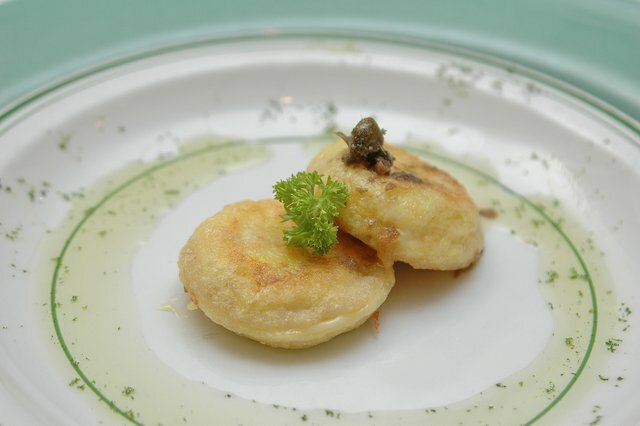 Oh, we guarantee your diet will fly out the window once you sample the Baked Escargots with Anchovy Garlic Butter (RM24++). The luxurious Wild Rocket, Parmigiano, Sliced Pear and Roasted Pine Nuts drizzled with Foie Gras Reduction (RM25++) is too good for rabbits so greenies will do well to order this. 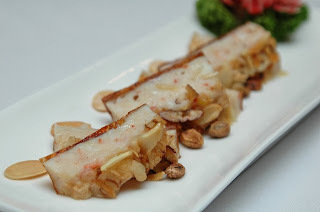 Who says ham yue (salted fish) is only fit for a pauper's table? 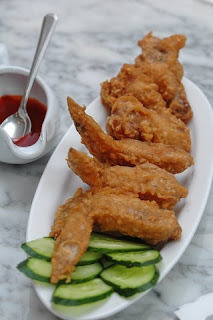 Crushed and mixed into the batter for Aromatic Chicken Wings (RM14++), the dish is fit for a king! Imagine biting into crisp batter and then moist, juicy and subtly briny chicken wings - oooohh...this humble ingredient deserves some new-found respect. But all said and done, we always look for a kick-*** dish that defines a particular restaurant. 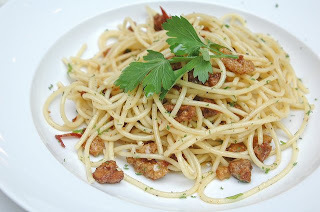 We certainly found it in the Pasta with Sun-dried Tomato and Duck Skin Croutons (RM25++). Inspired by an unforgettable French peasant dish of solidified duck lard eaten with fresh sliced baguette, Yeong's duck skin croutons are good enough to rival the regular chee yow char (deep-fried pork lard dices). Tossed with pasta, olive oil and sun-dried tomato, the simple combination worked like a charm. One gets a light, well-rounded gamey aftertaste in the pasta, with the crispy duck skin bits heightening the sun-dried tomato’s delicate piquancy. In turn, the latter prevents the dish from being overly rich. 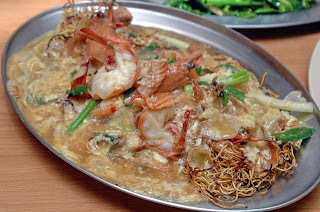 OK, local foodies can take comfort that the Prawn Noodles (RM16++) has all the requisite flavours nicely balanced too. 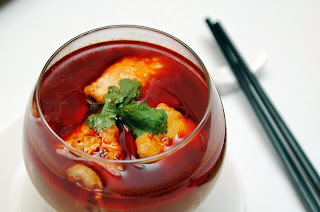 The soup is spicy without being tongue-numbingly so and has a tasty prawny sweetness to it. 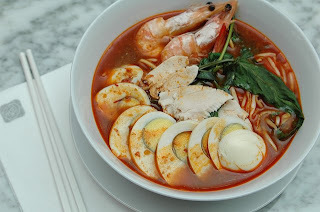 The recipe comes from one of Toto Ooi's relatives who runs her own prawn noodles shop back in Bukit Mertajam, up north in Penang. Served with decent size prawns, blanched beansprouts, kangkong, sliced chicken and hard-boiled egg, it is now one of Banquet's hot sellers. My only beef is the absence of crispy fried shallots to give it that essential finishing touch but Ooi has promised to rectify this. 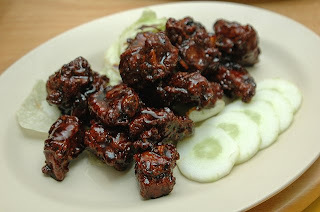 Imagine eating a rustic dish like Mee Jawa (RM16++) in achingly hip Bangsar! Well, the noodle dish is on the menu and worth trying. Even though the mildly spicy sweet potato and crab gravy is not as thick as I would have liked it to be, the dish more than passed muster with its generous accompaniments of sliced flour fritters and fried firm beancurd, crunchy flour cracker, prawns and beansprouts. Another diet-busting temptation that you must not miss is the Hot Chocolate Cake. 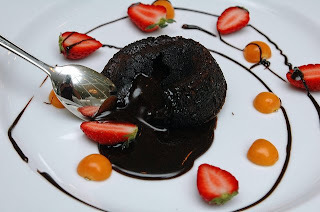 You have to wait 15 minutes for it but heck, this light, ultra-decadent chocolate cake with a molten liquid centre imbued with white truffles is simply to-die-for! Don't let the RM30++ tag deter you - go on and have it just this once! Saner diners may want to opt for the classic chocolatey or peanut butter filling. Inject a burst of 'sunshine' onto your palate with the Lemon Tart (RM9++) or pick up some Italian smoothness with its Tiramisu (RM18++). 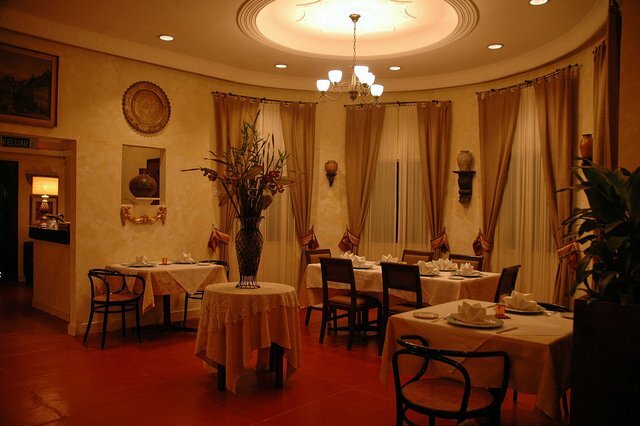 Overall, Banquet is well worth a visit for its prompt service, stylish ambience and most of all, some ravishing dishes. It won't be cheap but it's not gonna cost you a king's ransom either to feast at Banquet. For the price of a steak, you can beef up on endless cuts of grilled meat at ParkRoyal KL's newly opened Churrascaria rodizios (Brazilian grill) - Bossa Nova. Its sleek, modern interior boasts large, colourful wall murals with warm ambient lighting and a spacious custom-built dance floor. The idea here is not only to become a dining hot spot but also KL's centrestage for avid salsa and Latin dance enthusiasts to demonstrate their fancy footwork. 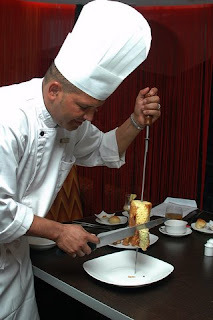 Resident passador or carving expert, Chef Marinaldo Monterio Pereira ensures the various marinated meats are grilled to perfection and that diners are kept satiated with endless servings of prime cuts of lamb, chicken, beef and even prawns hot off the grill. Humour him enough and he may just hog the limelight to show you some nifty dance moves of his own. One word of caution though when you dine here - it's best to pace yourself accordingly if you intend to go the whole hog and attempt to devour everything proffered. As long as you keep that little square beside your cutlery turn onto the green side, the passador will happily continue to tempt you with different meaty cuts. When you have had enough, flip it over to red as a silent signal to 'cut it out'. 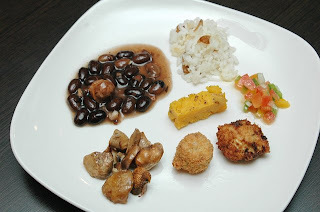 The protein-laden mains are pre-empted by an interesting buffet of typical Brazilian appetizers. Heavily influenced by the Portuguese and Middle-Easterners, you'd find many of the delicious starters incorporate black and green olives, lemon juice, fresh fruit vegetables and spices. Noteworthy choices to try include Salgadinhos Coxinha (breaded and deep-fried lightly spiced chicken croquettes), Hearts of Palm with Olives Salad, Raisin Polenta, Sautéed Mushrooms, Mixed Bean Salad and Fish Croquettes. I like the black bean stew which has smoky and mildly briny dried and fresh beef, and sausages. Known as Feijoada, it is apparently Brazil’s national dish. The proper way of eating it is with Stewed Rice (this has pine nuts and toasted garlic slices in it). The smooth, creamy Potato and Parsley Soup was especially good as were the Apple Salad, Black Bean Dip and Crushed Sweet Potatoes with Parsley. Do alternate your intake of herbed sausages, chicken ham, lamb, butter fish, tiger prawns and beef tenderloin with the refreshing, zesty salads or Abacaxi (grilled pineapple with cinnamon) to help balance the indulgent meatiness. 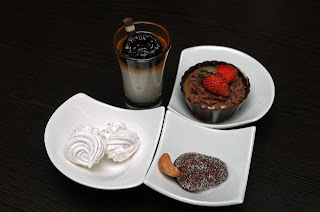 Dessert comprises a simple yet scrumptious selection. Top marks go to the Pave de Chocolate (chocolate cookie tart) for its mousse-like texture intermingled with chocolatey cookie crumbs. If you're nutty over nut-filled confections, then savour Cajuzinho, a soft Brazilian candy made from crushed cashewnuts and chocolate. For something lighter, opt for the Egg White Candy which is reminiscent of macaroons with crushed Oreo cookies and Manjar Branco, an enticing coconut flan topped with prune sauce. Service is efficient but the staff lacks confidence (well, at least for now) on how to guide diners more effectively so that they can be maximum enjoyment from their dining experience here. Bossa Nova has a seating capacity of 106 persons, inclusive of two private dining rooms and a full bar. 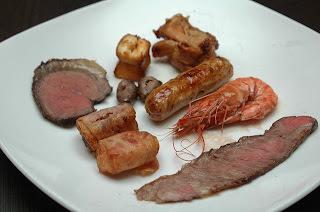 The buffet costs RM48++ per head for lunch and RM58++ for dinner - a steal considering what some steak houses in town charges for their meat cuts. It has been a long while since my last visit to Prince Hotel & Residence. Their pork-free dim sum has always been decent under veteran Hong Kong chef, Chan Kong Tung (formerly of the Regent KL's Lai Ching Yuen). Recently the hotel welcomes not only a new sifu to churn out these dainty morsels but also Chef Lawrence Eng to helm its Chinese kitchen. We were indeed lucky to have the chance to sample some of Chef Eng's signature dishes as depicted above. A trio of rather unconventional looking dim sum gave us an indication of what was to come - modern Chinese cuisine with a surprisingly pared-down approach yet cleverly imbued with global, totally Occidental flavours. Out of the appetising trio, the black har gow (shrimp dumpling) is by far the most intriguing for its simple, squid ink-induced, slightly chewy tang meen skin and springy prawn filling. 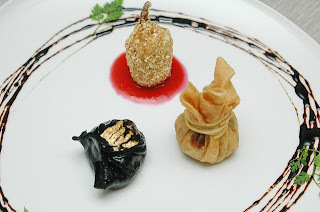 The miniature parcel actually contains foie gras, pine nuts and minced chicken - wonder if the chef makes the filling rich on purpose since in Thailand, a similar creation is known as money bags? The deep-fried crab claw which totters on the brink of normalcy is saved by its distinctive sauce that is concocted from beetroot, ginger juice, plum sauce, sugar syrup and fragrant oil. 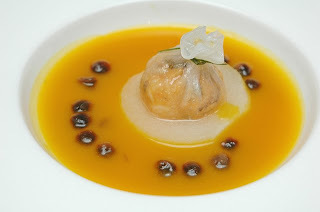 The world's most expensive spice, saffron weaves its magical colour and flavour on the Superior Pumpkin Broth with Crab Meat Dumpling and Dragon Pearls. 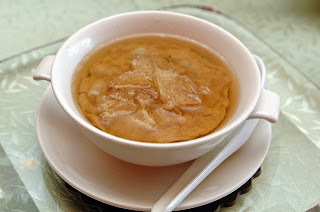 But the bland wintermelon beneath the dumpling detracted too much of the pumpkin’s muted sweetness. Perhaps it would have worked better had the wintermelon been poached in superior stock beforehand. Despite brimming with chunky crab meat, the sole dumpling also lacks 'oomph'. Luckily, the subsequent dish of Wok-fried Chicken and Pickled Lotus Root more than made amends for earlier shortcomings. I adore the delicious and subtle fruity sweetness of the rather sticky champagne sauce which coated the fried pieces of boneless chicken. Having the sour tartness and crunchiness of lotus root pickles to temper any cloying aftertaste is truly a brilliant move on the chef's part. Nothing beats a good piquant sauce and the Hot Bean Sauce generously slathered on the King Prawns dish got the thumbs up from around us. Instead of the usual whole steamed fish, the Seabass Roulade with Enoki, Chinese Chive Flowers and Superior Soya Sauce is ideal for diners who prefer easy-to-eat, boneless fish dishes with clear, unadulterated flavours. Personally I'm not really big on fish so I wasn't too hot on this. It's best to avoid the Steamed Glutinous Rice and Live Flower Crab Wrapped in Bamboo Leaves if you happen to be dining in polite company. Don't get me wrong - it's a tasty dish as the sticky glutinous rice is simply redolent with the crab’s inherent sweetness. 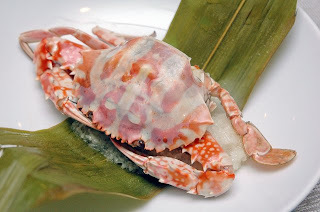 But to get to the crab meat, one has to get to grips with it and things can get really messy here. So unless you have time to devour this at leisure or in the casual company of family and bosom buddies, this dish requires too much work. Jasmine Tea Crème Brûlée and Baked Lotus Flower Cookies rounded dinner off on a sweet note. 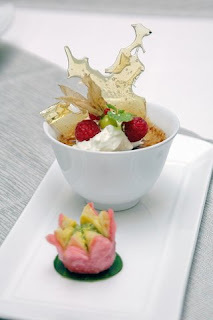 The first has this typical French dessert subtly perfumed with the bitter undertone and heady aroma of jasmine tea whilst the second turns out to be a work of art as the baked flaky pastry filled with lotus seed paste is beautifully shaped like a two-toned lotus blossom. Service befits standards expected of a five-star hotel except during weekday lunch hours. This is when diners may have to try slightly harder to get the staff’s attention as most of them rush around trying to cope with the hectic pace. I personally have had no bad run-in with their service thus far so this bodes well for the outlet. Ever since we were introduced to this outlet, it has quickly become a favourite haunt. Not only does the restaurant serves good food, the pricing is incredibly reasonable! From the outside it looks like just another corner single terrace house - few would actually have any inkling it's actually a no-frills Chinese restaurant that holds plenty of delicious secrets. Hot sellers here are its Fish Head Curry, Lightly Deep-fried Tilapia, Salt Baked Chicken Wings and Stir-fried Sang Meen with Fresh Water Prawns. And that's barely scratching the surface - the lady boss told us their other specialities include Hakka braised fried pork (char yoke), vinegared pork trotters, claypot ribs with yam, butter squid and hot plate hor fun...are you drooling already? The Curry Fish Head comes piping hot in a claypot, filled with ladies fingers, brinjal, long beans, cabbage, beancurd puffs and fleshy pieces of fish head in a fiery orangey-red gravy that goes really well with plain white rice. A small portion here can easily feed 3-4 persons or more if you have other dishes thrown in. 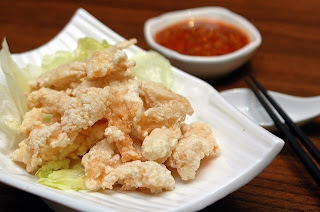 You can also ask the chef to substitute the fish head with tilapia chunks but it doesn't have quite the same 'fun' as digging and searching for that elusive piece of fish meat off boney creviches. 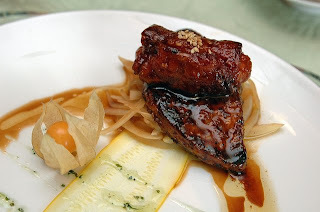 Even though the cook more often than not tends to overcook the Ribs in Beer Stout Sauce, the shortcoming is easily forgiven thanks to the bewitching, caramelised sauce that clung and enveloped the ribs completely. When it comes to Fresh Water Prawn Noodles or Sang Har Meen, nothing quite comes up to our gold standard - Sang Kee or what KL-lites used to know as the Tai Shee Tau (under the big tree)...Having said that, 52's version is still above average and perfect to assuage any prawny noodles craving! The crustaceans are of a decent enough size and I would have preferred the fresh egg and wheat noodles to be thicker but heck, it's as good as it comes. Generously doused with a rich, sublime eggy sauce that's not too starchy or watery, the crisp noodles are adequately 'soaked', rendering it nicely chewy but not soggy. 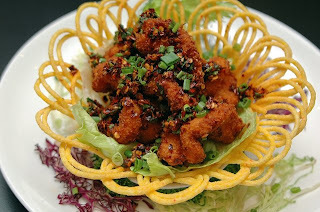 The kids usually go wild over the Chiu Yim Kai Yik or Deep-fried Salted Chicken Wings but you must remind the chef to omit the chopped bird's eye chilli that gets sprinkled on top together with spring onion. Forget that at your own peril - you don't want to go into crisis mode, trying to douse little numb tongues and soothe teary tots! The Claypot Taufoo is another kid-friendly dish which comes chock-a-block with local or Japanese beancurd cooked in a thick, oyster sauce gravy, chopped baby corn, snap peas, diced carrots, mushroom, assorted seafood and sliced pork. So if you are ever in the vicinity of Semenyih, 52 is a number you should remember. The outlet is easily located along the early stretch of Jalan Sungai Lalang, the same road leading towards Nirvana Memorial Park. Just don't bother going on a Monday since it's their rest day. 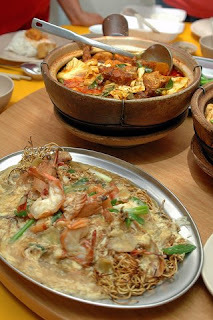 Few foodies can resist Sang Har Meen or stir-fried noodles with freshwater prawns. This dish reigns supreme amongst the many hawkers’ dishes available and the only one that can get away with restaurant's pricing! Now there's a new eatery in Taman Tun Dr Ismail that prides itself in dishing up some freshwater prawn dishes, whether on their own or with noodles or rice. 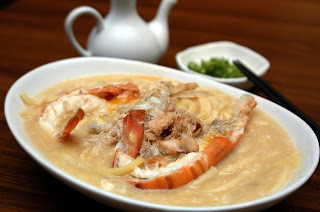 Its house speciality of Freshwater Prawn and Crab Meat Loh Mein (RM25 for regular, RM45 for large portion) is an extremely indulgent offering (forget about cholesterol counting for once). Braised in a rich, eggy sauce with two big, succulent freshwater prawns, the fat yellow Hokkien noodles tasted out of this world with a dash of vinegar in it. Devour the noodles whilst they are still piping hot though. Otherwise, you'd end up with an unappetising congealed dish as they cool. I'm dying to sample their Freshwater Prawn Braised Yee Mee, Freshwater Prawn Wanton Mee in Fragrant Soup and Freshwater Prawn Meehoon in Nyonya-style Soup. I have had better Fish Head Meehoon (RM8 – regular, RM13 – large) elsewhere but honestly, Zuho's version is as decent as they come. I prefer lai fun or thick rice noodles for this particular dish but to each her own I guess. 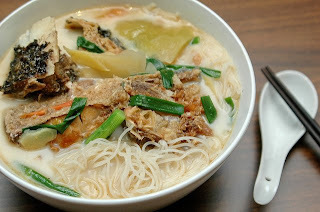 What stood out was the fleshy chunks of deep-fried fish head and delicious sweet-tangy soup that has generous slices of hum choi or salted mustard, tomato wedges, sliced ginger and chopped spring onion in it. The scrumptious Venison Fried Rice Nyonya-style (RM13 – regular, RM22 – large) fares better with me. Who can resist fluffy rice stir-fried with thin slices of venison, aromatic shredded kaffir lime leaves and local spices? I can only presume the Anchovy or Salted Fish Fried Rice, Beef Fried Rice Yong Chow Style and Crab Meat Fried Rice taste equally arresting. If you like Hong Kong-style korn chau hor or dry-fried flat rice noodles, resident chef, S H Lim or Uncle Lim as he is known amongst staff and customers, executes this with panache. 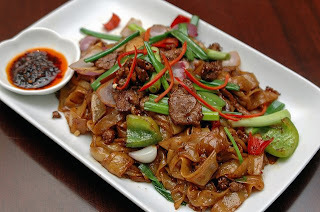 The Black Pepper Beef Fried Kway Teow (RM8 – regular, RM13 –large) remains slippery smooth, nicely separate and fully imbued with the robust nuances of freshly ground black pepper and sliced beef. For all the farn tung (die-hard rice eaters) out there, Zuho's small selection of home-style dishes make perfect accompaniments to have with plain white rice. 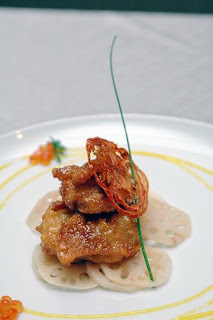 One of their specialities is Deep-fried Fish Fillet in Barreto Sauce (RM8 – regular, RM13 – large), a Filipina-inspired dish that comprised crispy, boneless pieces of fish fillet eaten with a tantalisingly sweet, sour and mildly spicy dip that has sesame seeds and chopped coriander in it. Har loke, a classic prawn dish for many major Chinese festivals, is superbly replicated here. 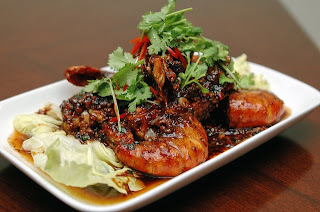 Its Freshwater Prawns Fried in Chef’s Special Sauce (RM30 – regular, RM45 – large) beg to be eaten with your hands to fully appreciate the dark, glistening and full-bodied sauce made from chopped garlic, red chilli, coriander, ginger, Worchestershire sauce, thick soya sauce and spring onions. 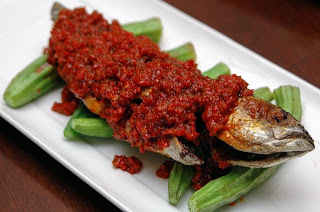 Chilli fiends will get fired up over the Nyonya Sambal Cencaru Fish (RM8 – regular, RM13 – large) as the ground chilli paste for this packs quite a wallop. The Kunyit Chicken (RM13 – regular, RM20 – large) and Stir-fried Chicken with Salted Fish (RM13 – regular, RM20 – large) come highly recommended as well. A surprisingly good Melaka Nyonya Cendol (RM4) consisting of thick, caramelised gula Melaka (palm sugar) syrup, rich coconut milk and short, fat and soft jade-green cendol strands is the perfect conclusion to your meal at Zuho. With its modern, spartan decor and quick, amicable service, Zuho is definitely worth the (reasonable) prices it is charging. Been missing in action for some time due to an unbelievably hectic last quarter in 2006. The last quake which disrupted the Net access didn't help either. Anyway another year beckons with more great dining experiences await! Believe it or not, eating well can be a vice...but heck, it's a blessed task that yours truly will undertake with no qualms whatsoever. 2006 has been a fair year filled with more fabulous food than mediocre eats so overall, it was memorable in its own way. For those who have been following my food treks, thank you for your support. Stick around and I'd clue you in on what's hot on the dining scene in 2007. Now let the feast begin! Get fresh - and enjoy a fruitful start to the Lunar New Year! 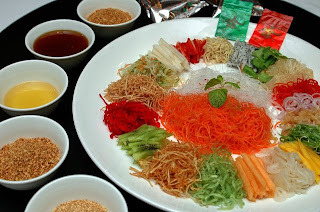 It is believed that yee sang or Chinese raw fish salad was invented some 1,500 years ago during the Song dynasty. Traditionally consumed on the seventh day of the Lunar New Year to mark the birthday of mankind, this humble dish has come a long way from its ancient origins. Come every Chinese New Year, local Chinese chefs will vie to bring fresh interpretations to this colourful salad. Over at the Si Chuan Dou Hua Restaurant at Parkroyal Kuala Lumpur, Chef Chew Chee Keong decides to make it a fruitful head start to the Lunar New Year celebrations with his Tropical Fresh Fruits Yee Sang. In addition to the mounds of assorted pickles, vegetables and deep-fried flour crisps, Chef Chew has included shredded kiwifruit, dragon fruit, strawberries, honey rose apples, snow pear, young mango, pomelo and rock melon to this ubiquitous festive delight. Diners can inject ‘liveliness’, ‘abundance’ and 'good fortune' to their order with shark’s fin, pacific clams, soft shell crab or yellow fin tuna, abalone, salmon or jellyfish. They even have a choice of different sauces – Fruity Sour Plum Sauce, Sour Plum with Wasabi Sauce, Spicy Thai Chilli Plum Sauce or plain Plum Sauce. The end result will be a light, tantalising salad redolent with a whole gamut of tangy, zesty, sweet and tart flavours without any cloying aftertaste. There's nothing like some Sichuanese spices to set jaded palates alight. 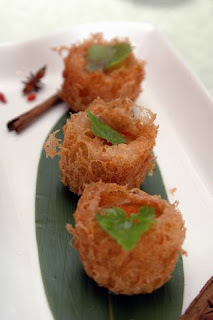 The Crispy Prawn with Spicy Bean Paste is guaranteed to leave your tongue tingling from its crunchy, spicy outer crust whilst the crustaceans remain deliciously succulent inside. But don't worry, you can always tempering things down with Crispy Stuffed Chicken with Prawn and Shark’s Fin Paste and Deluxe Nut Coating. Looking deceptively like roast pork from afar, this scrumptious speciality proves memorable for its varied textural contrasts and delicate nuances. A robust chilli dip served on the side helps to give extra bite to these springy slices. 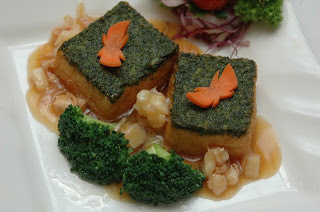 Shaped like mini gold ingots, the Homemade Green Puree Beancurd with Seafood and Scallops is distinctive for its top coating of jade green, blended seaweed. The silky smooth beancurd pieces are the perfect foil to emphasise the fresh scallop and minced seafood's inherent sweetness. The typical Sichuanese delicacy of Fried Spicy Fish Fillet Sautéed with Sichuan Peppercorns is unlikely to be forgotten in a hurry. Unlike the 'in your face' spicy tartness of Thai tom yum, its fiery-hued broth is potent enough to give chilli lovers an instant ‘high’ with its ma la (numbing spiciness) flavour. For the first time ever, those on a vegetarian diet can also look forward to a sumptuous feast at Si Chuan Dou Hua as Chef Chew has thoughtfully came up with a special Vegetarian Set Menu that will enable them to partake in the festive feasting. One of the specialities, Stir-fried Mixed Fresh Mushrooms with Seven Spices is something that will appeal to even non-vegetarians and diners who want a change from the normally indulgent fare served during this festive season. All the dishes mentioned are from the different set menus available. The Feast of Abundance is tailored for two persons at RM98++ and at RM318++ for a table of six. For 10 persons or more, choose from its Feast of Prosperity, Fortune, Health and Wealth set menu or Vegetarian Set at RM638++ per table. Small portions of Yee Sang are priced from RM38++ onwards while large portions are priced from RM68++ onwards. Go on, it is time to go the whole hog at the Parkroyal Kuala Lumpur for a fruitful Chinese New Year. For those in the know, Jalan Yap Kwan Seng is a food haven in its own right. The entire stretch of road boasts of Nyonya, Japanese, European, Indian, Chinese steamboat and Penang nasi kandar outlets so diners are truly spoilt for choice. However, few are aware of a splendid Italian restaurant tucked away in one of the quieter lanes known as Jalan Liew Weng Chee. Named after the Italian god of wine, Bacco, this understated restaurant is owned by architect Datuk Luciano Mirri and his interior designer wife, Burna who have made Malaysia their home for the last 22 years. 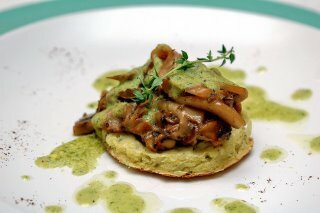 Their eatery prides itself on serving rustic home-style Italian dishes that are rarely found elsewhere. The inimitable style and creative handiwork of Datin Burna Mirri are evident in the hand-sewn table cloths and curtains, and sponge-painted walls within Bacco. 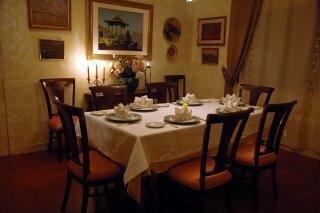 Oriental and European antiques, paintings and furniture further enhanced the classic, homely ambience. Chef Michele Dal Cero from Verona, Italy displays an uncanny flair for staying true to his Italian roots despite this being his first stint in the Far East and having to be mindful of local dietary sensitivities. Antipasti (appetizers) is a must here to start off your meal. 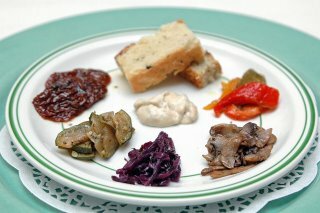 We enjoyed sliced marinated mushroom, pickled red cabbage, zucchini, red and green peppers, a creamy tuna spread, olives and sun-dried tomatoes with the two types of breads – onion and truffle and another flavoured with chopped olives. Italy’s simple, provincial-style cooking is best reflected in Frittata Ai Funghi Con Patate Alla Bacco or Bacco-style Mushroom Omelette with Potatoes. Special mention must be made of the accompanying sauce of boiled egg yolk blended with anchovies, extra virgin olive oil, thyme, lemon juice and salt. 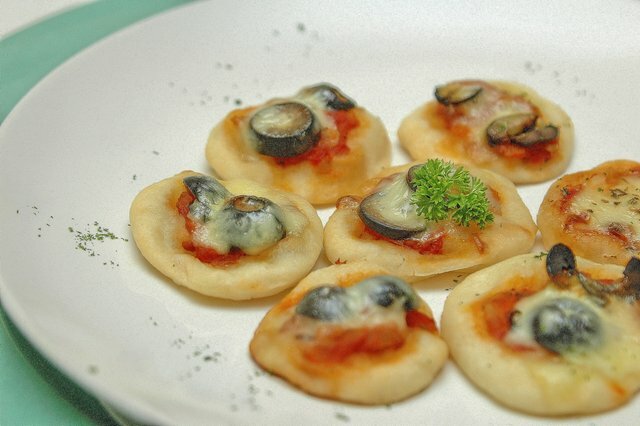 Chef Dal Cero gets back to basics with his Mini Pizzas with a single ingredient to top each miniature dough disc – chopped tomato, olives or grated cheese. It is a great way to savour the pizza’s delightfully light texture and unadulterated flavour of each topping. The Involtino Di Sogliola Con Salmone (Witch Fillet Roll with Salmon Garnished with Smoked Salmon) is as bewitching as its name. 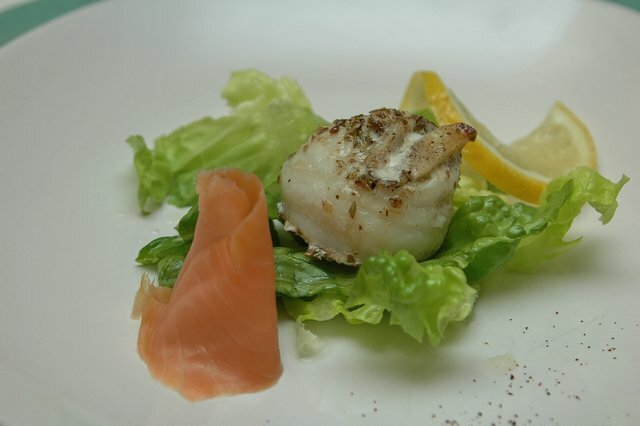 It is hard to fault this dish of baked sole fillet rolled and stuffed with fresh salmon and chopped romaine lettuce, complemented by a dainty roll of smoked salmon. The composition of subtle nuances and myriad textures proved the chef’s consummate skills. A scrumptious creation served with a distinctive anchovy-caper sauce, the delicious pan-fried Mozzarella la Carrozza mini sandwich would captivate any discerning cheese lovers. Lightly covered in egg batter, it oozed with melted, piquant cheese in the centre. La Padella Del Pescatore made us felt as if we were dining at an Italian friend’s villa in the Roman countryside. 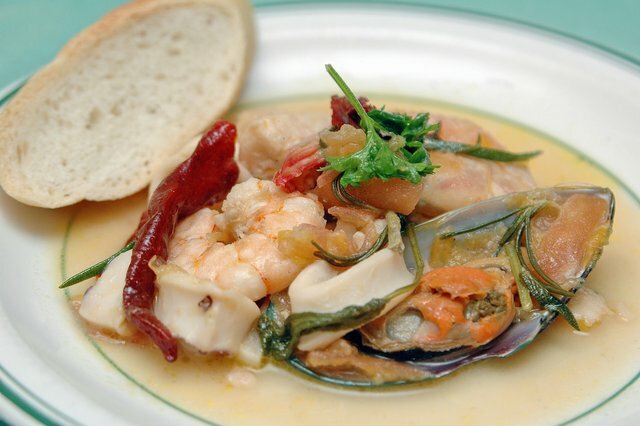 A hearty stew of fish, prawns, squid and mussels, the ingredients are first sautéed in extra virgin olive oil and cooked with chopped fresh tomatoes, garlic, white wine, chili, fresh herbs and black pepper. The deliciously sweet broth, tinged with the faintest hint of tanginess, is best enjoyed with crusty sliced baguette. A traditional carnival fried pastry known as Frappe gave us another rare glimpse into Italy. Also known as Cenci in Tuscany, Chiacchiere in Lombardy, Crostoli in Venice and Bugie in Genoa, the rectangular paper-thin, deep-fried pastry are served with a dusting of icing sugar. 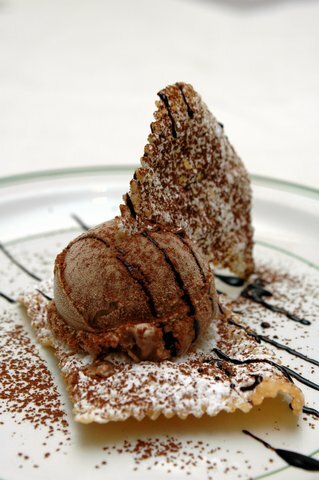 At Bacco, this delightful creation comes with ice-cream and a little warmer of melted chocolate which you can drizzle onto the crispy pastry. The perennial favourite, tiramisu, is also available although this being an alcohol-free version, it may be a tad tame for those who used to the original recipe. Thanks to Bacco’s niche set-up, service is cordial and impeccable. Bigger groups of eight persons or more should ideally notify outlet manager, Ahmad Radhi Abdul Shukor ahead of time so that the team is prepared to cope with service delivery and food quality. For those yearning for an Italian gastronomic sojourn, Bacco is well worth the trip.